Despicable Me 3, Illumination Universal's comedy adventure has officially crossed the $1 billion box office. This is the third movie of 2017 to reach the billion dollar mark, along with Disney's live action Beauty and the Beast and Universal's The Fate of the Furious. Illumination has developed quite the track record with its animated features, which combined have grossed nearly $6 billion worldwide. DM3 is its second film to take in more than $1B and its third to surpass $900M. The team who brought you Despicable Me and the biggest animated hits of 2013 and 2015, Despicable Me 2 and Minions, returns to continue the adventures of Gru, Lucy, their adorable daughters—Margo, Edith and Agnes—and the Minions. Parker voices the role of villain Balthazar Bratt, a former child star who’s grown up to become obsessed with the character he played in the ‘80s, and proves to be Gru’s most formidable nemesis to date. 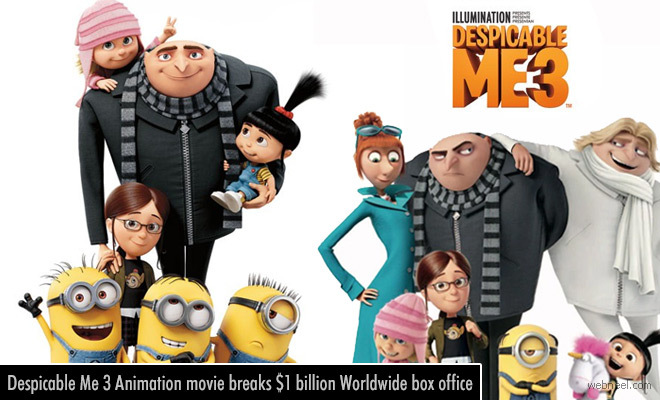 Despicable Me 3, directed by Pierre Coffin and Kyle Balda has hit the screen in June 2017 and becomes the 31st film ever to earn $1 billion and is now the 6th highest-earning animated film. The performance of the film has pushed the worldwide top-grossing animated franchise position, surpassing Dreamworks Animation's Shrek, and the top-grossing animated franchise at the international box office, outgoing Fox/Blue sky's Ice Age.